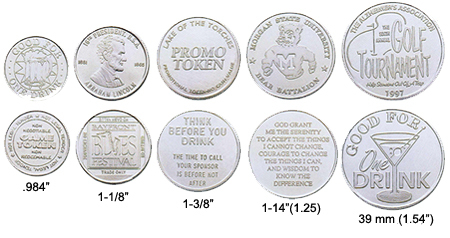 Customized Aluminum Coins and Tokens are the perfect way to add big excitement to your next promotion. These solid aluminum coins and tokens are ideal for lightweight mailings, inexpensive giveaways, and much more. Any of our coins and tokens can be personalized with one of our 200 stock designs or with the image of your choice. Aluminum Coins and Tokens are bulk packed. Coin prices are the same whether striking one or two sides (one die is needed per side). Please see our Die Charges Page for prices on our die casting. 2-4 weeks from receipt of camera-ready artwork.